Just what is the color of "flesh"? A detailed history of the PRR's 40-foot X31-series of cars. Also covered are the 50-foot X32 and X33 cars. Includes many prototype photos. A review of the 1996 Sn3 Symposium held in San Diego, California by the San Diego Sn3 Fellowship. 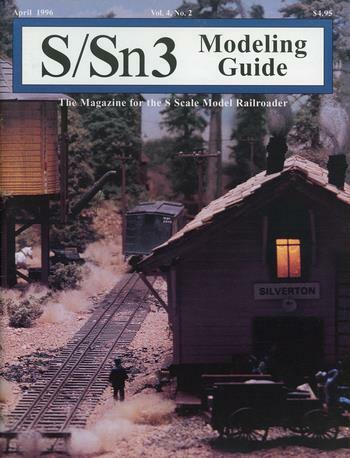 A group of Tucson, Arizona modelers wanted to build a portable Sn3 layout to show people what was possible in S-scale. Includes several photos. The author describes railfanning opportunities in the Detroit area, and shares a number of photos he has taken. Parlor cars were first-class coaches operated by Pullman or the railroads themselves, which had individual revolving seats that were much like reclining living room chairs. The author describes how to model one of these in S-scale using various manufacturers' cars as base models. Includes detail drawings for kitbashing. A review of this first structure kit by the company.